Voted one of the Top 15 Business Growth Experts to Watch by Currency Fair, business growth expert Meridith Elliott Powell is an award-winning author, keynote speaker and business strategist. With a background in corporate sales and leadership, her career expands over several industries including banking, healthcare, and finance. Meridith worked her way up from an entry-level position to earn her seat at the C-Suite table. Meridith is a Certified Speaking Professional ©, a designation held by less than twelve percent of professional speakers. She is also a member of the prestigious Forbes Coaching Council. Meridith has a cutting-edge message, rooted in real-life examples and real-world knowledge. Meridith writes, speaks and is passionate about helping her clients understand everything they need to know about how to make this economy start working for them. She had me in the first 30-seconds, high energy, amazing content, stories so relevant to the Nantahala Outdoor Center – every board member, dishwasher, raft guide, needs to experience Meridith! Funny, Motivating, Meridith engages, entertains, and gets your audience to do the impossible – take action! Thank you for the outstanding sessions last week in Manhattan. You are really helping our company advance to the next level and more modern times. Working with Meridith we doubled our sales – Best Year Ever! Why Book Meridith Elliott Powell? High energy and highly interactive, Meridith’s keynotes, workshops and innovative coaching programs help leaders and business owners learn the new rules of success today. This includes how today’s economy has changed, how that has changed today’s customers and employees, and specifically how that impacts your business. No walking on coals, no breaking boards, just real-life strategies you can put into place first thing Monday morning. Meridith is the author of four books, including Winning In The Trust & Value Economy (a finalist in the USA Best Book Awards). 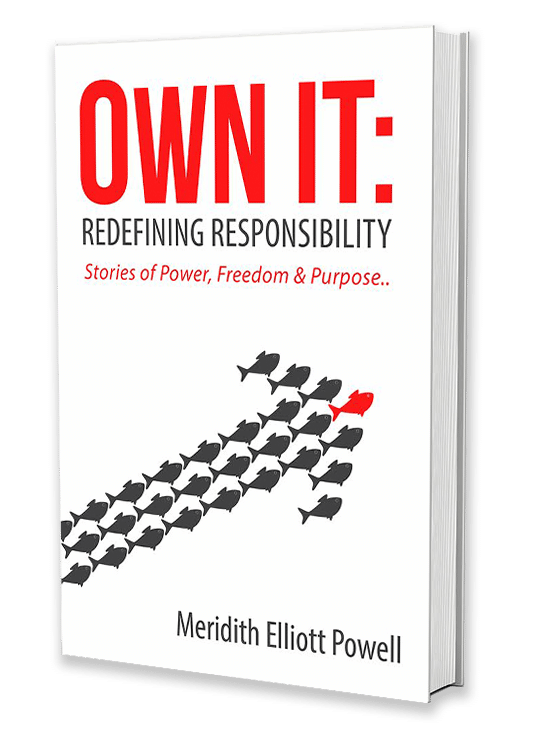 Her latest book Own It: Redefining Responsibility – Stories of Power, Freedom & Purpose identifies how to build cultures that inspire ownership at every level to create profits at every turn. Meridith writes, speaks and is passionate about helping her clients understand everything they need to know about how to make this economy start working for them.